Blogasaurus » Blog Archive » Feature Friday! I am so excited. I was featured in 2 blogs today! First my skulls were featured in Cuteable. 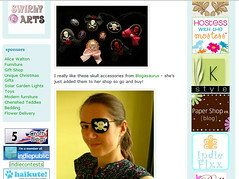 Then my Lollipops were featured on the Sweet Figments blog! Just a great day! So stop by both and check them out!